Fed up of hanging your washing around the house to dry? Or have you had enough of tumble dryers shrinking and ruining your clothes? With its gentle drying process and ample storage capacity, the ETS-1700E vented drying cabinet provides the ideal solution to everyday household laundry problems. 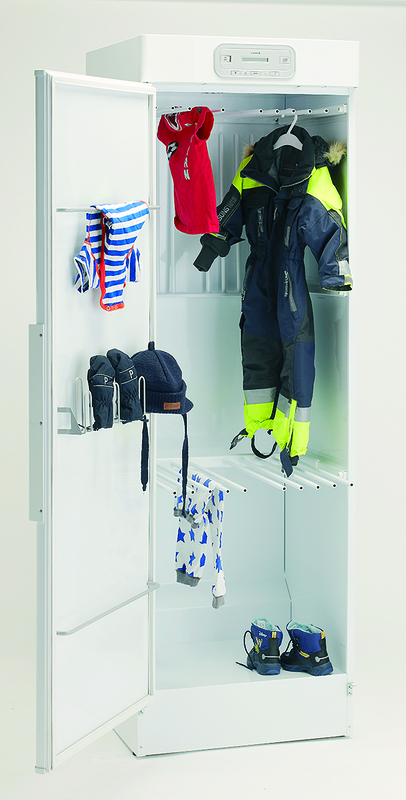 This versatile cabinet can dry anything from your usual washed clothes to wet boots, coats, hats and scarves. It comes supplied with 3 sets of hanging rails with the middle and lower rails being able to fold backwards to allow longer garments, such as towels and sheets, to hang freely from the upper rails. The rails can slide out to assist with the loading process. Optional glove and shoe racks are available. Various drying settings to suit all requirements can be chosen using the electronic display, including energy saving automatic programmes with sensor drying. The unit can be housed inside a fitted wardrobe or fully integrated into cupboards.